With the latest Lighting Plan, the sustainable development aspect of urban lighting has become an essential aspect. The goal is to light better while consuming less. From this point of view, the Festival of Lights is exemplary, using only 0.1% of the annual energy consumption of the city's urban lighting. 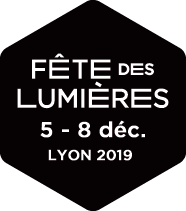 Festival of Lights organizers strive for maximum reduction of the event's impact on the environment through actions such as extensive reliance on public transportation, use of low-consumption sources (LEDs) and a reduction of printed programs in favor of electronic communication. Supporting artists who take the environmental dimension into account with the awarding of the Recylum Trophy for Sustainable Lighting. When projects are selected, particular attention is paid to materials, reuse and the transportation of materials and teams. More than half of the projects use energy-saving lighting devices. In 2015, one project uses only energy produced by renewable sources. This year, Métropole de Lyon communication on traffic, car-sharing and Vélov' bikes will feature the Festival theme.